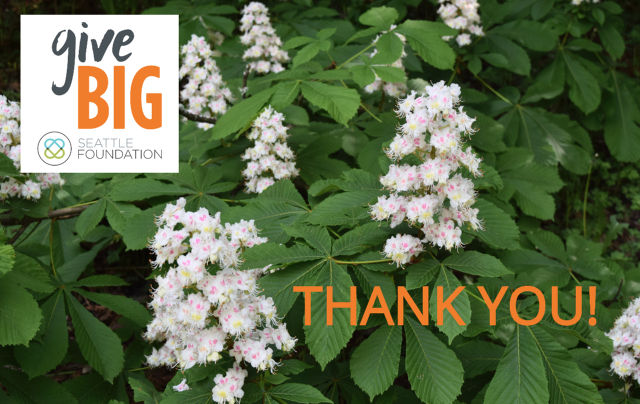 Thanks for Standing TALL for Trees During GiveBIG! Many thanks for the amazing support we received during our GiveBIG spring appeal this month. A total of 186 donors gave $35,315 to the Arboretum during the Seattle Foundation’s final GiveBIG event. Most of those donations came through the GiveBIG website on May 9, but we also received a number of gifts through the regular mail in response to our GiveBIG-themed spring appeal letter. The total amount includes a $7,500 matching challenge that came to us from several close supporters and we unlocked by exceeding the number of GiveBIG donations we received in 2017. Thanks again to everyone who participated! Your generous gifts will help pay for the environmental education programs at the Arboretum, and help ensure the future of this beautiful haven in the heart of Seattle. Our thanks also to the Seattle Foundation for hosting this amazing annual fundraiser for the past eight years. PHOTO: Chinese horse chestnut (Aesculus chinensis) blooming by the Loop Trail, just below the New Zealand Forest.